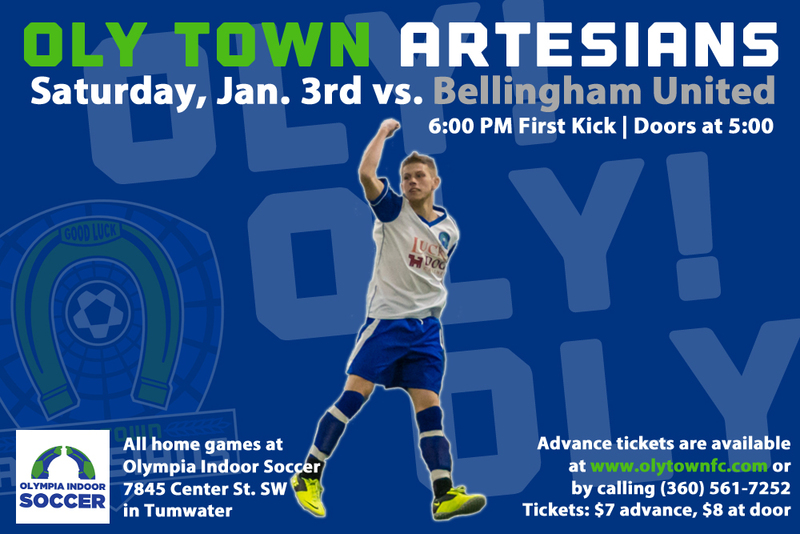 OLYMPIA, Wash. – The Oly Town Artesians (2-2-0, 6 points) kick off 2015 and the second half of the Western Indoor Soccer League season on Saturday night with a rematch against a familiar foe. Bellingham United (2-1-1, 7 points) comes to town fresh off a 7-5 win in the last game of 2014 that knocked the Artesians out of second place. Sitting just one point behind the Hammers, Oly looks to return the favor on Saturday, January 3rd in a 6:00 PM kick off at Olympia Indoor Soccer. The two teams met two weeks ago at the Bellingham Sportsplex in a game that got away from the Artesians because of fouls and penalties. Willie Spurr scored at the buzzer of the third quarter to draw the Artesians level at 5-5 but Bellingham took advantage of three blue cards and scored two power play goals in the fourth quarter to take the 7-5 victory, their second of the season. Brendan Quilici scored a brace for the Hammers while Tanner Williams and George Bundy scored in their debuts for the Artesians. Both teams played without one of their top scorers and Oly will be still be without the services of veteran Matt Stalnik, who is out for the season after an injury against the Arlington Aviators on December 13th. Andrew Weishaar and his five goals did not play for Bellingham in the last game and his status for this week is unknown at this time. Including Stalnik and Weishaar, six of the top eight goal scorers in the WISL hail from Bellingham and Oly. Willie Spurr and Greg Wolfe are tied with Weishaar for second place in the league with five goals each and Nate Salveson and Stalnik are tied with Quilici and Tacoma’s Kyle Danielson for third place with four goals. Tacoma’s Derek Johnson leads the league with 11 goals. The Artesians are 1-1-0 in WISL play on their home field of Olympia Indoor Soccer. On December 6th they picked up the first win in franchise history with a 10-8 win over the Wenatchee Fire thanks to a hat trick from Stalnik. Meanwhile, Bellingham have yet to win a road game this season after a loss to Tacoma in their opener and a draw at Wenatchee. Tickets to Saturday night’s game are $8 for adults and $5 for kids 5-12 years old and will be available at the door beginning at 5:00 PM. First kick is scheduled for 6:00. The beer garden will be open for fans 21 and over, the kids area will feature Artesians coloring pages and other crafts and there will be other games and prizes throughout the night. Olympia Indoor Soccer is located at 7845 Center St. SW in Tumwater on the backside of the Capitol City Tennis and Athletic Center.